In all six of its volumes The Broadview Anthology of British Literature presents British literature in a truly distinctive light. Fully grounded in sound literary and historical scholarship, the anthology takes a fresh approach to many canonical authors, and includes a wide selection of work by lesser-known writers. The anthology also provides wide-ranging coverage of the worldwide connections of British literature, and it pays attention throughout to issues of race, gender, class, and sexual orientation. It includes comprehensive introductions to each period, providing in each case an overview of the historical and cultural as well as the literary background. It features accessible and engaging headnotes for all authors, extensive explanatory annotations, and an unparalleled number of illustrations and contextual materials. Innovative, authoritative and comprehensive, The Broadview Anthology of British Literature has established itself as a leader in the field. The full anthology comprises six bound volumes, together with an extensive website component; the latter has been edited, annotated, and designed according to the same high standards as the bound book component of the anthology, and is accessible by using the passcode obtained with the purchase of one or more of the bound volumes. The two-volume Broadview Anthology of British Literature: Concise Edition provides an attractive alternative to the full six-volume anthology. Though much more compact, the Concise Edition nevertheless provides instructors with substantial choice, offering both a strong selection of canonical authors and a sampling of lesser-known works. 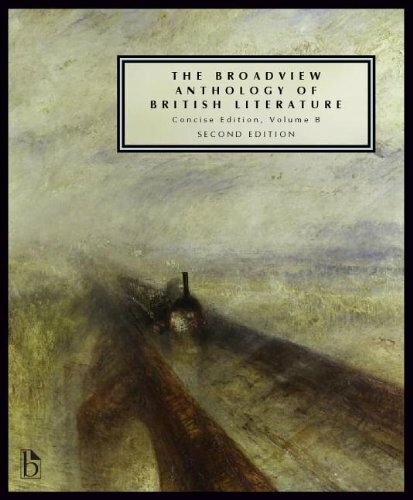 With an unparalleled number of illustrations and contextual materials, accessible and engaging introductions, and full explanatory annotations, this edition of the acclaimed Broadview Anthology provides concise yet wide-ranging coverage for British literature survey courses.